Anyone faced with the task of preparing material for publication needs guidance. This sixth edition of the Style Manual provides guidance and detailed advice on publishing in both print and electronic formats. It represents a substantial revision in response to the rapid and extensive changes that have occurred in publishing since the fifth edition was produced in 1994. The new Style Manual continues to provide detailed information and recommendations on the best practices in design, editing, production and writing. This edition builds on the Style Manual's reputation as an outstanding Australian reference standard for all those who understand the value of effective communication. 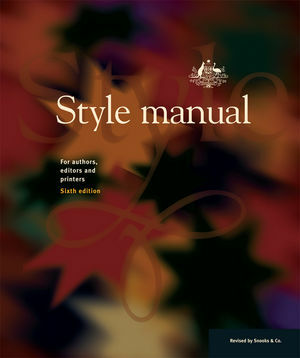 DCITA is the author of Style Manual: For Authors, Editors and Printers, 6th Edition, published by Wiley.